Kalamazoo, MI: On July 31, 2018 at approximately 12:30 AM, Kalamazoo Department of Public Safety Officers made contact with a vehicle near the intersection of Elizabeth Street and Cobb Avenue based on a complaint from a neighborhood resident about loud music coming from the vehicle. Upon contacting the lone occupant of the vehicle, officers observed a handgun in the vehicle, and the subject was taken into custody. A subsequent search of the vehicle revealed a loaded handgun, several packages of suspected marijuana, crack cocaine, and heroin, a digital scale and related paraphernalia. 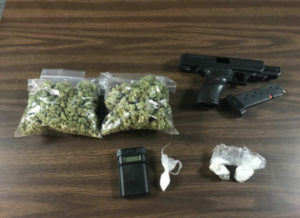 The nineteen-year-old non-Kalamazoo-resident was charged with Carrying a Concealed Weapon, Felony Firearm, Possession of a Stolen Handgun, Possession with Intent to Deliver Crack Cocaine, Heroin, and Marijuana, and Excessive Noise. He was lodged at the Kalamazoo County Jail. We thank the citizens of Kalamazoo for continued communication with our department regarding quality of life issues in their respective neighborhoods. Anyone having further information regarding this incident is asked to contact the Kalamazoo Department of Public Safety at 337-8994 or Silent Observer at 343-2100.